Striking midcentury woven rattan tub chair, circa 1960s. This sculptural occasional chair or side chair is designed with intricately webbed rattan and open weave seat and back. 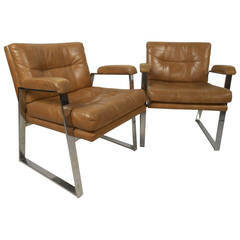 Fun, mid century tub chair. 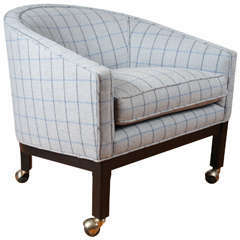 Newly upholstered, in a pleasing, wool plaid. Mahogany wood frame, rests on rolling brass castors.